Becoming a landlord involves more than simply purchasing a property, turning the keys over to the tenant, and cashing the rent checks. 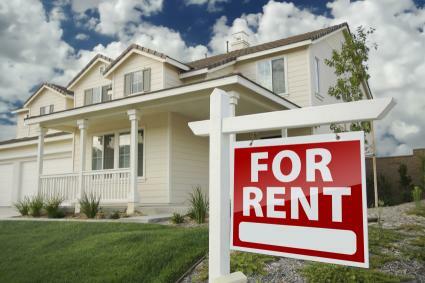 The landlord-tenant relationship gives both parties certain legal rights and responsibilities. To protect yourself and your property, you'll want to draft a lease agreement that outline your rights and responsibilities as a landlord. Like any other business transaction, entering into a landlord-tenant situation creates a contractual relationship between the parties. 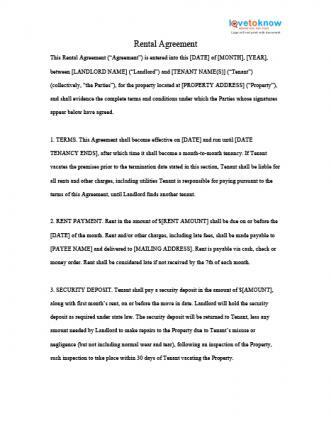 The residential lease agreement lays out the terms of that contract. At its most basic, the lease agreement should include the term of the lease, the monthly rent, and the due date. If there are no other provisions included, state law prevails if a conflict arises. However, including additional provisions to the lease agreement allows you to have more control over what happens if issues arise. This template includes sections that cover the most common issues that arise in landlord-tenant situations. This template allows you to create a customized residential lease agreement. You can download the form and save it to your computer's hard drive, which gives you the option of completing it at once, or coming back to it at a later time. For help on how to download the printable, check out these helpful tips. Before using the lease agreement, it is important to check the laws in your state to make sure there aren't any required provisions not included in the template. Some states also prohibit certain provisions from being included in the agreement. The lease agreement contains a clause stating if any section is found to violate state law, the remainder of the agreement is still valid, but it is always a good idea to check your state's landlord-tenant act prior to signing so you can remove such provisions from the agreement. Section 27 of the lease allows you to include any additional information not in the agreement. This allows you to customize the lease to fit your needs. For example, you may wish to prohibit your tenant from running a business on the property, from installing certain types of lighting, or limit the tenant to using certain utility companies (if the tenant is responsible for paying for utilities). If you choose to include any additional provisions to the agreement, make sure you give the additional provisions a title - for example, "Addendum A" - and include the title on the line in section 27 marked "Other." Failure to reference any additions in the lease and/or attach the additions to the lease could make them unenforceable. Unlike other legal documents, a lease agreement does not require witnesses, nor does it need to be signed in the presence of a notary. The parties do not even need to be in each other's presence when it signed - the landlord can sign it one day, and the tenant another. If you sign the lease after the tenant, make sure to review it carefully prior to doing so. If the tenant struck any provisions from the agreement and you sign, your signature on the lease could be used as evidence you agreed to the changes. This could make it difficult--perhaps impossible--for you to seek damages or evict the tenant if he violates that provision. After all parties sign the lease agreement, make a photocopy and retain the original, including any attachments, for your files and give a copy to the tenant. If issues arise in the future, the lease is a record of your and the tenant's understanding of the agreement and can help bolster your case in the event an eviction or other legal action is necessary.